When we began to plan a trip to the Albuquerque Balloon Fiesta a year ago (October 2015) it seemed a long way off. I had yet to finish my final, and seemingly the longest year of teaching. It's hard to believe the time had finally arrived! 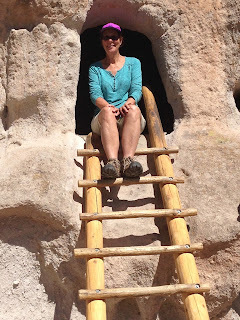 I decided to call this trip is a wander because, except for a night in a hotel in Santa Fe and reservations at the balloon festival on October 3, we had no set plans or reservations. We began wandering by caravan with Joan and Ted at the park and ride lot on 116 in Cotati. From there we caravanned to Bab's Delta Cafe in Suisun City where we met Terri for Brunch. We continued on I 80 to Donner Memorial State Park near Truckee, Ca. Arriving around 2 p.m. The afternoon was beautiful. We walked to Donner Lake and soaked in its beauty. The evening was just as gorgeous with very comfortable temperatures. After a hectic day yesterday getting everything ready to leave we were pretty tired and called it an early night knowing we'd have a longer day of driving tomorrow. When I awoke at about 1:30 a.m., the sky was filled with stars, too bad it was also filled with the roar of trucks on I 80, the sound reverberating through the valley where the campground is located. It's too bad being such a lovely campsite. We left Donner Lake around 8 and headed to the east on I 80. Lots of trucks were also traveling east. Because the speed limit was 75 mph, the 450 miles of nothingness happened a bit more quickly. We stopped for lunch at a nice city park in Winnemucka. The drive continued pretty much the same until we got close to Elko. The mountains became a little more interesting and the town of Elko had a lot of character. As we approached the Ruby Mountains the scenery changed dramatically. We entered a valley that was carved by a glacier, a mini Yosemite. The campground,Thomas Canyon Campground, was in the Lamoile Canyon along a stream with stands of Aspen, a lovely place to stay for a couple of days. The evening was a bit cool, but we were toasty inside our camper during the night. We explored the surrounding area, driving to the end of the Lamoile Canyon, where backpackers were taking off up the glacial valley. While there we hiked the nature trail. It was a short hike of 1/2 mile through the Aspens and past a recent beaver cut. To provide building materials for their dams and lodges as well as food for their families, American beaver harvested the Aspen forest, tooth -carved stumps abound. Beavers use their Iron-coated incisors to efficiently cut the stumps. These beaver pounds provide some of the last standing water in periods of summer drought and some of the only unfrozen water in winter. Early afternoon we hiked up the campground trail, and I do mean up, about a quarter a mile to a beautiful little waterfall sliding over granite. Bushes with red berries were growing in the canyon. The water was flowing from glacier melt up the mountain. The trail continued on another mile and a half to a meadow that is a pond in the spring. We visited the California Trails Interpretive Center. It was a beautiful visitor center, chronicling the westward movement to California. The streets of Elko were filled with people with maps and wine glasses. It seems on the 2nd Saturday from 4 - 6 downtown business host a wine walk. Guests paid 25.00 for a wristband to walk around and taste wine. It was strange to see people walking the streets and drinking. In October there will be a beer walk. We celebrated Joan's birthday at an Luciano's Italian Restaurant. Dinner was tasty and the service excellent. We were early risers, leaving the campground at 7. Joan, Ted and Terri were headed to Angel Lake and then over the mountains to Ruby marshes. 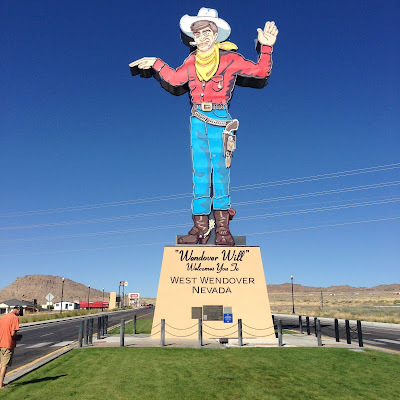 We set out for Bonneville Salt Flats and Great Salt Lake.Before leaving Nevada we stopped in the town of West Wendover, very much a Nevada border down, filled with huge casinos to attracted the poor souls in Utah. Upon entering town, we were welcomed by Wendover Will. Wendover Will was originally erected in 1952 by the Stateline Casino and named after the owner, William Smith and the town of Wendover. 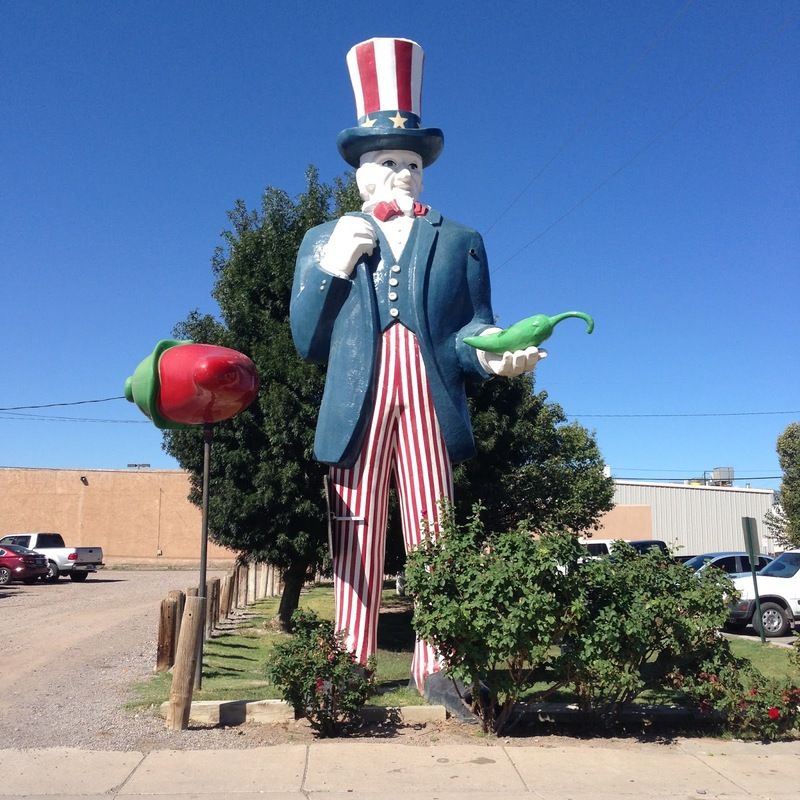 At 63 feet tall, he was intended to draw travelers from Highways 40 and 50, now Interstate 80. When driving east a caption reads, "this is the place" and to the west. "Where the West begins". Wendover Will was included in the Guinness Book of Records as the "World's Largest Mechanical Cowboy." West Wendover overlooks the Utah desert and the Great Salt Flats. There were no less than 5 very large hotel/casinos in this small town on the Utah Nevada border, pretty obvious it serves Salt Lake City. As we approached the Salt Flats it appeared we were driving towards water, that never materialized. We drove out on a roadway of salt for about 4 miles to a point where the it was closed because a car race was taking place. The temperature was a very comfortable 68 at 11:45 AM. After a long drive across the salt flats, we arrived at the Great Salt Lake State Park at 2:30. It had a visitor center and a small campground with 5 sites on the marina. There were 2 sites left when we arrived. We spent the afternoon relaxing and enjoying our view across the lake to Antelope Island. A nice cooling breeze off the lake and the view made this park an excellent location close to SLC. Tour buses pulled in and out of the visitor center until about 4:00 pm. At 6:00 the gates were locked until 6 am. We did have a key so we could get out and in, if we chose. We saw lots of the Utah State Bird the California Sea Gull! Afternoon on the lake shore was very pleasant, then after dinner something began to blow in. Winds were gusting up to 40mph according to Accuweather. Glad to be in a camper! We were rocking and rolling all night with wind gusts up to 40 mph. That, along with the warm temperatures made it a restless night. We packed up and drove into Salt Lake City for breakfast at The Park Cafe across the street from a large city park near the university. We had a delicious traditional breakfast for about $20.00, prices were a reminder we were out of Sonoma County! After breakfast we drove downtown and parked across from the state Capitol at a visitor center and hiked down the hill past large homes to temple square. The gardens were beautiful, overflowing with colorful flowers. A crew was working to put Christmas Lights up in the trees, they had begun in August! We saw a multitude of white males in black business suits and white shirts walking between buildings. We were able to enter the tabernacle, where the Mormons get ready to worship. The acoustics were fantastic, a tour guide dropped a pin and a needle and you could hear the difference in the back. 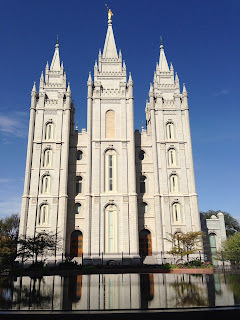 It was fun to imagine listening to the Mormon Tabernacle Choir perform. Before leaving town we walked down a little further to the mall to visit the Apple Store so Mark could buy a new keyboard for his iPad. 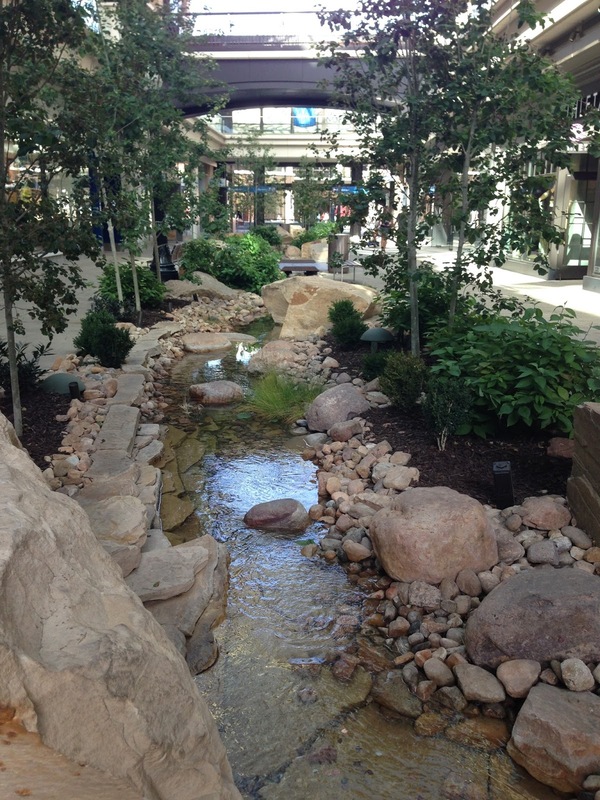 The mall was beautiful, full of high end stores with stream running through the middle. To get back to the car we hiked along a creek that runs along a park, it ended up to be a nice walk, but long and uphill. Once back to the car we hunted down a Trader Joe's downtown to resupply before heading out of town. The drive out of Salt Lake was on I15, pretty much like I15 anywhere. We got off to take the Nebo Scenic Highway, planning to camp at Peyton Lake. The drive was like a autumn calendar page filled with fall leaves and winding up to 9,000 ft.
We decided to continue on and not stay at Peyton Lake. We did stop and walk a short trail to the Devil's Playground, said to be a mini Bryce. It was a micro mini Bryce! We had thought we might find an RV park once we got to the main road that would take us back to I15, but saw nothing and were underwhelmed with the area, so we continued on, planning to stop if we saw an inviting place. Realizing we were less than 2 1/2 hours from Torrey, we decided to forge ahead and awake next to Capital Reef National Park. Our route on Highway 24 took us through farmlands in a valley with forest fires burning in the surrounding forests. The sunset was spectacular due to all the smoke. 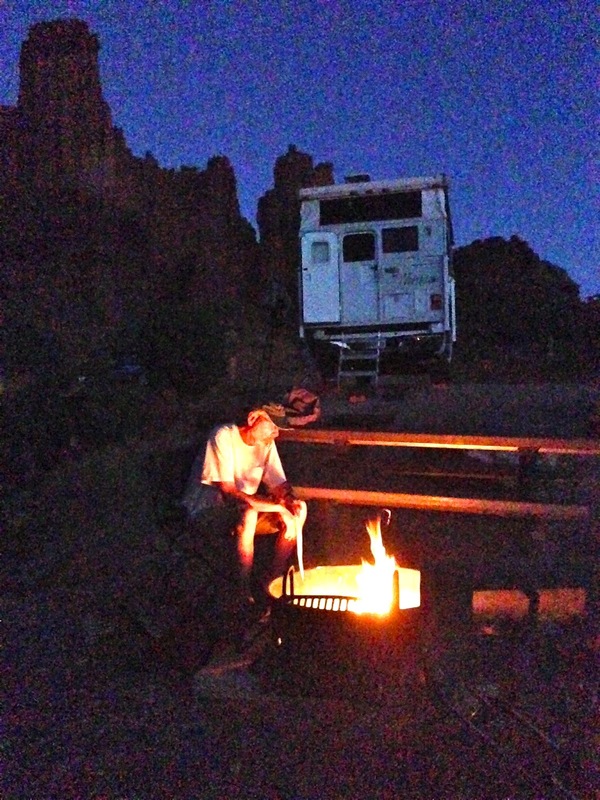 We arrived at Thousand Lakes RVPark around 8 and were able to get a site in front of the Mesa. By 8:30 we were fed and relaxed. When I awoke in this gorgeous setting I was so glad we'd pushed on yesterday. After a lazy morning at the campground, showering and laundry, we headed for CapitolReef National Park. I had forgotten how beautiful the drive became approaching the park, it made the view I enjoyed in the morning look minuscule. We drove into the campground and there were available sites at 10:30, but there were also a multitude of people, the parking lot at the visitor center was overflowing with cars and RV's and tour buses dropping visitors. As gorgeous as this area was we decided to forge into the back country and Cathedral Valley. The road is a dirt road over 18 miles east of the visitor center and about 29 miles of dirt road back to a small campground with 5 campsites. As we drove back the clouds in the sky became black and ominous, dropping hail, while the temperature was 77 degrees. We passed 4 cars while driving into the valley. Gypsum Sink was a mile off the road and a good place for lunch. From there we drove on about 5 miles through the cathedrals and up 3 rocky switchbacks to Cathedral Campground. There was only one campsite taken. A few hundred feet from our site we could look down on Cathedral Valley. We enjoyed cocktail hour at the edge overlooking the cathedrals. We actually saw a car drive down the switchbacks, so make that 5 cars, besides the 2 camped here, we saw today. The sun kept playing peak-a-boo with the clouds. We watched the light come and go until the wind began to gust and rain fell. Back in the camper the wind continued to blow, but the sun did come out without any black clouds around. Once we were in bed the rain began, along with thunder and lightening. One strike was so loud it seemed to be right on us. It seemed like the rain continued throughout the night. When we got up between 6;30 and 7, the ground was not overly wet, whatever rain had fallen had evaporated. We made coffee and started down the switch backs and out of the valley. The streams in the valley were running with enough water to make it a bit slippery as we drove, not to mention the mud that was kicked up onto the undercarriage of the truck. The camper was covered with red dust that was now streaks. We drove back to Glass Mountain and Temples of the Moon and Sun. By the time we reached the highway it was 10:30, too late to get a campsite at Capitol Reef, so we decided to continue on to Moab for the night. When Highway 24 reaches Hanksville it goes straight and turns into Highway 95 which goes to Hwy 276 to Glen Canyon and Lake Powell. or turns left as Highway 24. I think I was messing with my phone and not paying attention and unbeknownst to us we were on highway heading for Lake Powell. We were about 27 miles down this road, a beautiful drive, unlike what I remembered highway 24 going towards I 70 being, but I thought I may have forgotten, everything seems more grand than I remember! Once we saw the signs for Lake Powell we turned around and headed to the real highway 24. They were doing roadwork on the highway. Which goes to Moab and we were stopped for about 30 minutes. Moab seemed to be even bigger, with more hotels than we remembered. We stopped for a late lunch at about 2:30 at The Spoke on Center. We shared a burger and fries that tasted great, we were pretty hungry. After a stop at the grocery store, at about 3:30, we headed to the KOA hoping to get a spot . September is one of the busiest months in Moab. We were able to get a spot right behind the office, close to the restrooms and showers. It was shady and quiet. Around 5 we headed out of the park and were surprised to see about 16 RVs in a line all the way back to the highway waiting to get in! We felt lucky to have gotten a space, the couple who pulled in next to us the next morning had slept in the grocery store parking lot having gotten in late and unable find a site. We drove into The Arches National Park as the sun was going down, what a beautiful time to be there. We walked back about half a mile on the Devils Garden Trail. It's a beautiful trail that would be worth a longer walk, it goes back to a couple of different arches, but the setting of the trail is gorgeous. By the time we drove out of the park it was getting dark and the moon was brightening the sky. We had a really lazy morning, stayed in bed until 7:30! We showered and reorganized before leaving the park about 10. We stopped and walked along the street in town and looked in the shop windows before heading out highway 128 for Colorado. We had forgotten what a gorgeous drive 128 was along the Colorado River surrounded by all the red stone cliffs. About 15 miles down the road is a wonderful looking resort, Red Cliffs Lodge, probably pretty pricey, but what a spot! We wanted to check out Fisher Tower about 22 miles down the road and 5 miles up a gravel road before leaving. After Cathedral Valley this road was a piece of cake! Once up to the campground and noticing the incredible view all around we decided this would be the spot for tonight. When we arrived around noon with only one of 5 sites taken, as I write this at 4, all are now filled. Being a BLM campground our price as seniors was $7.50. A trail head takes off for Fisher Tower just above the campground, we went up and walked a short way on it, until we saw it goes down, down, down and up, up, up. A 4.4 mile round trip that takes 4 hours. We'll save that for another trip. We did walk up to another overlook for photos. During the evening hours we watched as the Colorado River Valley became lighter and lighter, but we couldn't find the almost harvest moon. Finally, we found it hiding behind Fisher Tower. This is a great place to camp to enjoy the surrounding beauty and still be close enough to Moab for all the creature comforts! Another beautiful morning! We watched the sun rise around camp, cooked breakfast and headed for Colorado. Rather than turn left to go down and back track and get on the Interstate, we chose the scenic route to the right that parallels the freeway. A short ways down the road we came to the town of Cisco, a goldmine of photographic opportunities for Mark. From the town of Fruita in Colorado we climbed the red rock mesa to Colorado National Monument. The road climbs up the flagstone rock along the cliff side for 23 miles through scenery very similar to that in Utah. After a stop at a market in Grand Junction we set out up the Mesa to Grand Mesa. It was quite a climb from the sagebrush up into the pines and the Aspens. We spent the night at Jumbo Campground and made the short hike to Sunset Lake and a connecting beaver pond. We awoke to a chilly morning. By the time we packed up and turned on the car, just before 9am, the temperature was 34 degrees. We decided to head down off Grand Mesa and find a campsite where we would have hookups. Hookup's were important for two reasons, first to run the heater and the second was to be able to plug in the fridge so we could trouble shoot why it wasn't cold on the gas setting. We stopped in Montrose to gas up both the truck and the propane tank. We were down to 1/4 of a tank, which could be the problem with the fridge. We began looking at campsites around Richmond just in case the 4J 1 + 1 in downtown Ouray was full. We arrived in Ouray about 12 and had our choice of about 8 sites. We chose one on the end so we would only have one neighbor. At 6:00 we didn't have any close neighbor's, which is nice in a park that packs them in like this one. Neither of us slept well, probably worrying about the refrigerator, so Mark lied down to rest and I took a shower. The restroom/ shower rooms were about the cleanest and most comfortable we've had so far on this trip. The laundry room is equally as nice. We paid 36.00 a night for the site. We decided to book 2 nights here and make a day trip to Telluride since its lower and a bit warmer and there's a Blues and Brews festival in Telluride this weekend. Mid afternoon we walked downtown and looked at the storefronts. The sun was bright and really warm. I was sad to see the silversmith shop that I liked so well was gone. We stopped at the Ouray Brewery, where you sit on a patio on the roof overlooking the Main Street and the hillside, and shared a huge plate of pulled pork, coleslaw and beans. I enjoyed a tasty Blonde Ale and Mark had an Arnold Palmer and the bill with tip was $30.00. We lazed around and relaxed the rest of the day and night. Once the sun came over the mountain it was bright and warm. We enjoyed breakfast at camp before heading over the mountain to Telluride. Actually, the drive we took was around the mountain. Another beautiful drive full of soaring mountains and beautiful fall colors. It took about an hour to get to Telluride. We knew it was a ski resort, but we were not prepared for such an upscale town. The Main Street was lined with enough shops that it would take days to go through them. The homes had beautifully landscaped gardens. A blues and brews festival was taking place in the town park which caused the town to be teaming with people. We could hear strumming as we drove past the park. A parking spot had just opened up only a block from town, in front of a beautiful Presbyterian Church, probably left from church having gotten out! We walked to the ski lift and rode to the top to a mountain Village, a much quieter place to be, and back down. Bike riders use the lift to get to the top and ride down. We browsed the very expensive shops and galleries, I saw a cute flannel shirt for $179.00. We drove up to check out Matterhorn, where I had planned for us to camp, driving over Lizard Head Pass. Our site back in Ouray was very quiet compared to Telluride! This morning we loaded up and drove the Million Dollar Highway to Silverton for breakfast. The changing colors of the trees made it a million dollar drive! Silverton had a lot more shops than I remembered. We had a good breakfast at the Brown Bear Cafe and walked the storefronts. I'm loving the beautiful hand women's I'm seeing in this area. We continued on to Pagosa Springs where we stopped to restock our refrigerator a a City Market, the Ralph's chain in Colorado and Utah. It was mid afternoon by the time we arrived in Chama. We headed straight to the Cumbres and Toltec Train Station to be sure we could get tickets on the steam train for tomorrow. As we arrived there was all kinds of activity going on around the station with people from the town folks standing around watching. When we purchase our tickets we were told a movie was being filmed and we would be bused from the Catholic Church up the street to the first train crossing to catch the train because the station area would be closed for the filming of a movie. I suggested to the ticket agent that we were thinking of camping at Heron Lake State Park. She informed us they had drained it to get minerals out of it and ruined it, but it would be better than the close proximity of sites in town. We stopped at the visitor center to get more information and the woman gave me a flyer on Navajo lake which was quite a ways back. She must have been rattled getting ready for the center to close the next day. I wondered if it a was for good, or just for the season. There's not much to draw people to Chama, other than the train. When we arrived at Heron Lake State Park it took us awhile to figure out where the campground with hookups and showers was. It was Blanco with nice big sites with lots of privacy and electricity and power. Only a few sites were taken. We drove down and looked at the sites overlooking the lake, they were pretty, but much smaller and lacked power and flush toilets. Draining of the lake had caused it to be quite low. It would have been beautiful with water in it. As long as you stayed in the shade, it was a pleasant afternoon. We arrived at the train station around 9:00, 30 minutes early, to watch the filming of the movie. What a change had occurred over night! Now the station was abuzz with people in period costume. The movie being filmed is Hostiles staring Cristian Bales. We met the bus at the church that drove us about a mile to where the train crossed Highway 17. The train pulled up and stopped traffic both ways as the passengers boarded. I was told that this is the first time this has ever happened. First time the trains had to be boarded on Hwy 17! The ride to Osier was beautiful over canyons and through beautifully colored groves of Aspen. We boarded the train at 10:00, stopped for water, and arrived at Osier at 12:30. Lunch was cafeteria style and good. We had meatloaf, mashed potatoes and salad bar. The canned vegetables in the hot section didn't look appetizing to me. The station at Osier had been set up as it would have been at the time when the train ran. We re boarded the train at 1:45 for the ride back to Chama. After the big lunch the train practically lulled you to sleep. We arrived back in Chama at the Catholic Church at 4 and rushed to the station to see if we could catch more filming, but it was all moving out. Back at the camp it was a lovely evening. We enjoyed sitting around camp and the fire. We could see the storm clouds approaching. Too bad there isn't more to do around this park, it's been a great place to camp. We awoke to rainfall on the roof this morning, but by the time we were up and outside it was beautiful. We celebrated the first day of autumn with pumpkin pancakes. along highway 64 to a crossing of the Rio Grande Gorge. As we approached the gorge we saw a community of completely recycled homes, Earthship Biotecture. Not really our style. We left the forest and ended up in the sage brush of Taos. We wandered Taos streets looking at the galleries. Everything looks like an Adobe, Chevron, Mc Donald's, Walgreens! Wonder if the Walgreens in Sebastopol will blend so well? We drove 30 minutes out of town to camp at Angel Fire RV Resort, having called ahead and made reservations for 2 nights. The park is very nice and the facilities are beautiful, I think I'm the only one whose used the ladies room, but this is not what we consider comfortable camping. I think we're one of 20 campers in the park that holds over a hundred. We began the morning with a stop at the Vietnam Memorial StatePark that was practically across the street from our RV park. It was a well done and informative memorial to the war. The video was well done. 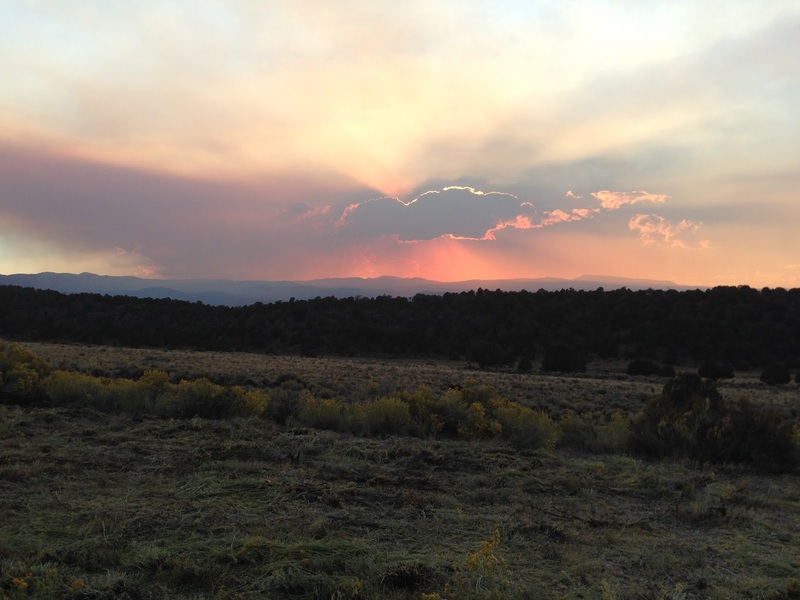 We drove on to finish the Enchanted Circle by traveling through Red River, Questa and Taos. Mark stopped along the drive out of Taos to shoot a building and realized we were across the street from the church thatAnsel Adams shot. The buildings in the area look original. We even found a restaurant to return to later for dinner, having decided we didn't want to drive back in to the traffic in Taos. Continuing along the highway south we visited Dixon, a town Mark had read about in the free travel magazine. It didn't have much, except for a very nice weaver and a couple of wineries. 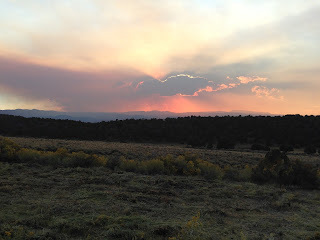 We drove back to Rancho Taos along the high road to Taos from Espanola. Back at the RV park we had quite a thunder and lightening storm. We left Angel Fire planning to drive out to the Wild Rivers Recreation Area. There weren't a whole lot of people there and the wind was howling so we decided to continue on to the Great Sand Dunes National Park. What a great choice it was to continue on. In the evening a storm blew in. 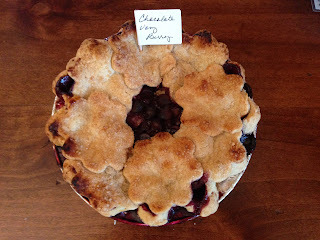 I was thankful to have an inside space to cook in and felt rather guilty as I saw all the families in tents around us. When we went out to visit the restroom at 8:00 the campers steps were covered with ice. We opened the camper door to see a light blanket of snow. Rather than wait for things to thaw, we drove out to where we could easily walk on Dunes and made breakfast. A few miles south of the campground was a dirt road that went up in the mountains to a campground. We drove up it and hiked to Zapata Falls. After having lunch back at out campsite and watching cars come and go on Medano Road we decided to drive out and see how far we could go. We turned around before the road started to climb too high because of the narrowness of the road and the traffic coming towards us driving so crazily! A 6:30 departure from our lovely campsite at Piñon Flats saw us at the San Juan Valley Airport by 7:00 for Mark's flight with his photographer friend, Steve, from Denver. I was surprised at how small the plane was, pretty funny with 2 big guys in it! Because of weight restrictions, Mark had to limit what eauipment he took up with him. Off into the wild blue yonder! They were up in the wild blue yonder by about 8:50. After the flight we took Steve to Efs for breakfast. Not a great looking place, but the breakfast was fantastic, worth the long wait for the food. We decided the girls waiting the tables must also have been the cooks. We were on our way south towards Santa Fe by about noon. The drive was very pleasant, the desert was covered with pines and rolling hills. As much as we wanted a shower, we decided to spend the night at the Juniper Campground, a National Monument Campground next to Bandilier NationalMonument. The evening was very pleasant, after the 2 nights before that had been so cold and windy we couldn't make a fire, when we packed up to leave the Great Dunes we found that someone had stolen all our wood and this campground had sold out because they had a Spanish Opera Concert at the amphitheater the previous night 😞. We were out of luck in the fire department on this lovely evening. We did enjoy watching a gorgeous sunset. The morning was warm enough for me to sit outside and enjoy my coffee before getting dressed. We took it easy this morning and moved our car across from the campground to a parking lot for the shuttle to Bandelier National Monument. We hiked about 2 miles and enjoyed climbing in and out of the caves via ladders. The walk back to the Visitor Center took us along the river. You can see why the Pueblo Indians chose this beautiful and abundant place to settle. We drove for about 10 miles up, and I do mean up, the Jemez Mountain Trail to the Caldera, an eminence valley caused by a volcanic eruption. A gorgeous drive hampered by a recent forest fire. I could only imagine how gorgeous it would have been if all the trees had been alive. As we approached Los Alamos we were surprised to find ourselves in a gate for a security check. The woman at the gate said that we could either pull over and she would search our camper, or we could turn around and go back through White Rock, an extra 20 miles on mountain roads. 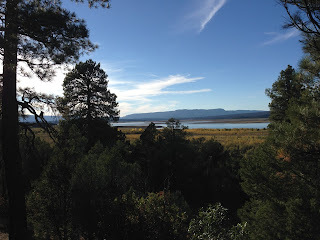 We pulled over and the woman looked in the camper and we were on our way down the road to the town of Los Alamos. Los Alamos was a town full of government buildings that still research all things nuclear. We stopped at the Bradbury Science Museum, a disjointed poorly done design wise, history of nuclear power past and current. We watched a short video on the history of the Manhattan Project, and saw the photo we have at home with Grandpa Pat flash on the screen. It was about a 30 minute drive to our hotel in downtown Santa Fe where we settled in and watched the historic debate where Donald Trump was his narcissistic self. Breakfast at The Old Santa Fe Inn was served in a nice dining room. It included a fruit bar and fresh squeezed OJ, Belgian waffles, and all the fixings for a breakfast burrito: scrambled eggs, bacon, tortillas, beans potatoes, cheese and salsa, along with toast, bagels and cereal. After breakfast we headed for the plaza area. We were tempted by shirts, scow skulls and blankets in the first store we entered, but decided it was close enough to the inn we could always return later. We peruse a few other shops on our way to the Georgia O'Keeffe Museum. We were most impressed with the show which spanned her life. We continued around the plaza area before heading back to the. Inn to put our feet up and eat our dinner leftovers for lunch. After a little rest we caught the "pick up" to the top of Canyon Road. Our plan was to walk to the end and take the "pick up" back to the inn. We were overwhelmed by all the art work about a third of the way down and could take no more in! We made it to the bottom skipping lots of galleries and shops. We learned of the other art district, the Rail Yard. By the time we caught the shuttle it was quitting time for the driver and he drove us close to our hotel. We planned to figure out where to go for dinner, but lost the motivation after chips and guacamole in the motel lobby. We walked over 5 miles and we're pretty pooped. Leftover pizza in our refrigerator made an easy dinner and we called it a night. After another nice breakfast we packed up and set off for the Turquoise Trail. town of Madrid was interesting and funky with jewelry and art shops. Along the way there were a few strange installation art pieces. Near the end of the trail we turned on the road to Sandia to check out Tinkertown Museum, but ended up turning around because it looked like a bunch of old junk. The rest of the drive to the RV park near Carlsbad was pretty long and flat. We thought Roswell's Alien Museum might be interesting, but it was pretty gimmicky looking. Every chain hotel around seems to be represented in Roswell. The town south of Roswell was Artesia. It was full of gas and oil pumping operations. We also passed what we believe were groves of pecan trees. We spent the night at the Carlsbad KOA, a spacious KOA and that was maybe 1/4 full at most, so it was very quiet. We had the only campfire on a beautiful evening! We stopped for breakfast at Pecos River Cafe, a locals joint. It was a flurry of activity with great service. After breakfast we drove into Carlsbad Caverns National Park and Heritage Site. The desert really changed as we drove up into the Guadalupe Mountains. Neither of us really had high expectations about what we would see upon entering the Caverns. We opted to ride the elevator down the 750 feet, rather than walk the 1 1/2 down. Once down below we walked aver 2 miles through rooms filled with Stalagmites, stalactites, popcorn, curtains, straws. 2 United States Capitol buildings would fit in this room. It's beauty is indescribable. I hesitated about driving out to the Caverns because it was so far, but am so glad we did! We drove about an hour north of Carlsbad Caverns to the town of Artesia, anything but an artesian well! The town smelled of natural gas, there were so many oil operations. Here we turned west and drove through the Lincoln Forest and the town of Cloudcroft, a ski town, and dropped down into Alamorgordo, quite a contrast. The drive in through the mountains was beautiful and in Alamorgordo it's a spread out desert town. We headed south of Alamogordo for Oliver Lee State Park and nabbed a site with hookups before driving 26 miles to White Sands National Monument, to watch the sun set. White sands was not too crowded and was yet another incredible monument. We arrived back at camp about 8 in the dark. We climbed inside the camper for dinner since the wind was blowing. Pretty incredible to see two such magnificent places in one day. It seems like I heard rain drops on the roof most of the night, but by the time we woke up it was a steady rainfall. Good that we hadn't unpacked much in our haste last night, what we did is soaking wet! We drove back to White Sands and spent a few hours there before heading south to Las Cruces. Mark was surprised at what a large town it had become. We drove to the University so he could see his alma matter, it too had grown! We then went to Old Mesilla Village to see the old town. Old adobes with some trinkets from Mexico for sale, we ate in a Mexican restaurant that was very popular, but we felt the food was just ok.
We spent the night at a nice KOA that overlooked the valley that Las Cruces is in and the adjacent Organ Mountains. The view from the park was really nice, a good place to dry out all that got wet last night and do laundry, but we did hear a lot of road noise until the wee hours. The KOA was really close to a scenic route to Hatch. We drove through pecan orchards and watermelon fields as we left Las Cruces. The road wound along the Rio Grande. As we approached Hatch, we began to see fields of chili's, the drive reminded me of driving through the Central Valley of California. We stopped in Hatch to look for a hat for Rob, but didn't find one. Hatch had mainly one thing, chili's, and lots of them. I bought a sandwich bag of medium New Mexican Chili for 3.00, it'll last a long, long time! From Hatch we traveled through Truth or Consequences, couldn't see a reason to stop. Further up the road was Bosque de Aztec, an incredibly well managed wildlife preserve. We took the driving tour and walked out on a board walk, but only managed to see a little brown jobber, a hawk and 2 squirrels. They had seen turkeys earlier, but we missed them to. We were told the Sandhills cranes were in Las Vegas, NM, they'd arrive in about a week. A little farther down the road and west about 50 miles we visited the VLA. We continued east and camped at a great BLM campground, Dari Well Recreation site. It only cost 2.50, and is so quiet! What a contrast, we are up around 7,000 feet and the temperature is in the low 40's this morning. We decided to pack up and drive in to Pie Town for breakfast. We ate at the only open Cafe in town, The Gathering Place. When we opened the door it was like we were walking into someone's living room, there were 2 large tables with 3 people sitting and drinking coffee, a young man hiking the Continental Divide from Oakland, a woman who was walking the tail and interviewing people about what happiness is, from Vermont and the cafe owner, a Dallas Transplant who had been in town 1 1/2 years. She lived 13 miles down a dirt road, and said to live here you had toe tough, or learn to be tough. While we were eating locals dropped by, including the Propane truck driver who was ordering as we left. The population of the town is 60, including 5 children who are home schooled. The Pie-o-ne'er is the shop that was featured on Sunday Morning on an episode filmed 5 years ago. What a fun experience! Now the adventure begins, where will we end up tonight so that we can shower? We left Pietown about 9 headed towards Santa Fe. As soon as we had cell service I called the Old Santa Fe Inn and booked their last room for the night. As we passed through Albuquerque we noted the exit for the balloon fiesta in anticipation of tomorrow. Once we arrived in Santa Fe we parked near the Rail Yard District and explored the galleries in that area. We checked into the hotel and we're pretty beat from the drive the day before. We ordered a salad to go from the pizza place we ordered from earlier in the trip and ate it and the pie we purchased in Pie Town in the room. Once checked out of the hotel we parked the truck downtown and walked around the shops. Mark spent quite a bit of town in an Art Gallery in the Loreto hotel. By about 12:00 the streets were full of tourists, much busier than they had been the previous Tuesday, we wondered if it could have been because of the Balloon Fiesta. We set out for Albuquerque and our "camp site" at the Balloon Fiesta. It was a bit of a maze figuring out where to go, but once we had, check in was a breeze, it took all of about 5 minutes. We were led to a space in the balloon museum parking lot next to a tree, that meant shade! We were told that because of the wind the balloons didn't go up this morning, what a disappointment, perhaps the people had gone to Santa Fe. We visited the balloon museum for an hour or so. It was a very well done museum on the history of ballooning and the balloon festival. The wind had begun to blow pretty hard so we sat in the camper and relaxed for most of the afternoon. Around 6 we decided to check out the concessions at the festival, but they had closed at 4. We actually slept better than we had in the hotel the night before. We were up soon after 5 and out on the field before 6. We were surprised to find out that most of the concessions right after we walked in weren't public, but sponsored for private groups, there must have been at least 10 large tents. We kept walking and finally came to a carnival midway where there was coffee for a Mark and lots of picnic tables on the field. We parked ourselves at a bench and awaited dawn patrol, it never happened. A little while later we noticed 6 balloons tethered down the field. We left our campsite about 9:00 and headed towards Arizona. We were surprised to see 3 balloons that were still aloft as we drove down The freeway miles from the field. This on tried to follow us home! To break up the drive we decided to stop at the Petrified Forest National Park. We spent more time than we thought we would because it was so beautiful. The painted desert truly looked painted. We ended up driving all the way through Petrified Forest National Park in order to loop back to the Freeway heading west. After getting a camp site at Homolovi State Park we drove the 2 miles in to Winslow, Arizona, made famous by Jackson Browne in the Eagles song, Take it Easy. We found the corner where there is a nice mural and statues of Jackson Brown. On the other 2 corners touristy gift shops sell Route 66 memorabilia and Take it Easy Hats and shirts. One shop has the Eagles blasting on outdoor speakers. Other than that the town was very depressed. I had expected a town similar to Williams that had been restored, Winslow was just run down. They were re doing the main street through town, so perhaps that will be the impetus for more. We enjoyed the desert morning and had breakfast at our campsite before jumping on I 40 in route to Parker, Arizona. The drive was a lot more scenic than I expected. Approaching Flagstaff there were red mountains and then we were in the trees. Stopping in gas in Williams the weather was brisk, not warm. The drive after Williams on I40 continued to be scenic into Kingman and across the river. Last trip we drove Route 66 and explored the sites there. We were surprised how quickly we were across the border. We decided to bypass Parker, where the forecast was for a high of 88 and a low of 60 and drive on through to Joshua Tree National Park. Google said we would arrive at about 3:15. After Needles we took the turnoff for Essex and about 180 miles across the desert to Joshua Tree. 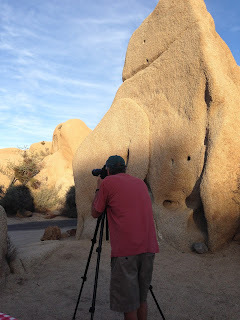 Mark loved the desert around Amboy and spent a lengthy amount of time shooting in the area. By the time we found a campsite in Jumbo Rocks it was about 5 and a beautiful desert evening. We cooked dinner as we watched the sun set. As we were enjoying our campfire I noticed something that looked like a tail scurry under my feet. Pretty soon Mark saw it, turned out kangaroo rats were in the bushes and they seemed to be attracted to the fire, they were pretty brazen! We'd scare them away and they'd be right back! What a fabulous place to end the camping portion of our Western State Wander. We have not been able to camp in Jumbo Rocks since Rob was a toddler, about 30 years ago. It is another of those magical places. Mid week in October is the perfect time to visit, not too hot, not too cold. Today we head over the hills to spend some time with Candace and Kevin and then over yet another hill to spend time with Bob and Peggy and Mel and Nette before starting the grueling journey through LA and up I5 on Saturday. When we arrive home on October 8 we will have been on the road for 1 incredible month! 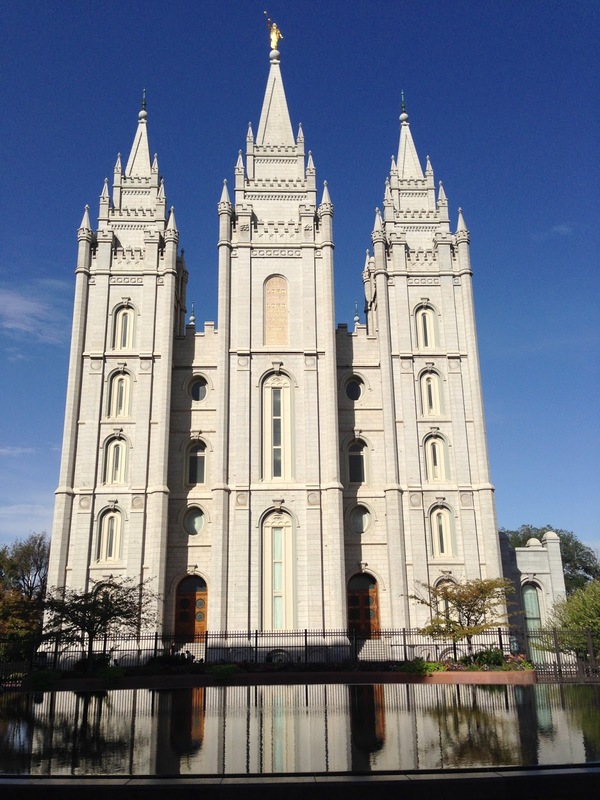 In retrospect, it's funny how the journey to the Balloon Fiesta led us to so many incredible places!